Being a squat and having a squat scene active and visible on decent platforms may have some importance in these times of repression. Reading about houses being squatted and evicted is one thing, being able to find each other, not only on-line, knowing which are our public events has its importance to strengthen us all. There were a few squats opened these last weeks in Amsterdam. Plantage Middenlaan 64 was squatted on September 8th. Property from the Kingdom of Morocco, these 2000 square meters are now being transformed into a social center, providing a give away shop, a library and a people’s kitchen. We can only recommend you to go there and help them. 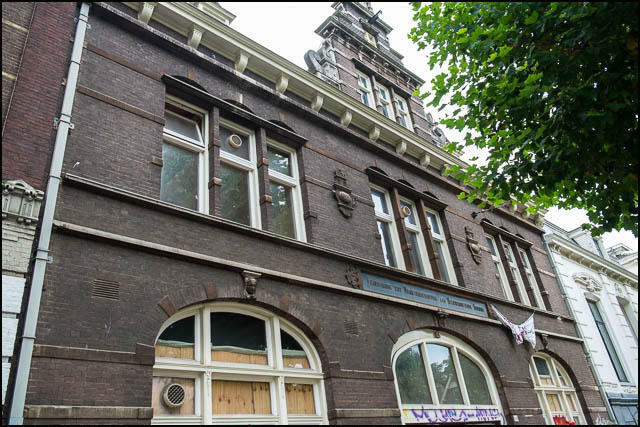 Wilhelminastraat 151 ground floor, property of Eigen Haard, was squatted on September 15th. 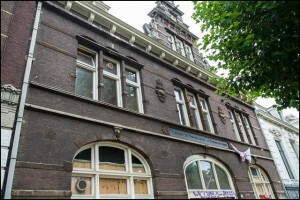 Another ground floor, also from Eigen Haard, was squatted on October 1st. The Dutch government has again expressed no consideration or solidarity for refugees in the Netherlands. 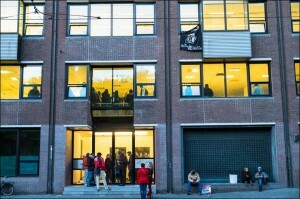 By October 1st, the refugees from the Vluchflat on the Jan Tooropstraat 29, had to leave their building squatted in June. The answer was quick to come. 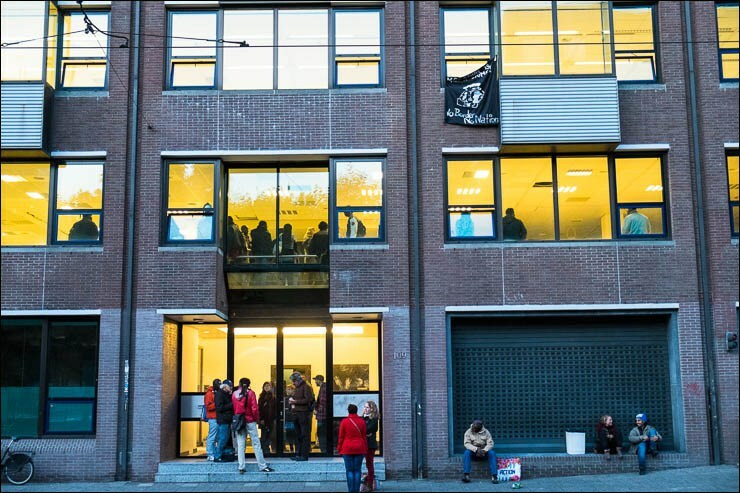 On October 2nd, the empty office building on the Weteringschans 109 was squatted and has now became the new center of the ‘Here We Are‘ campaign. 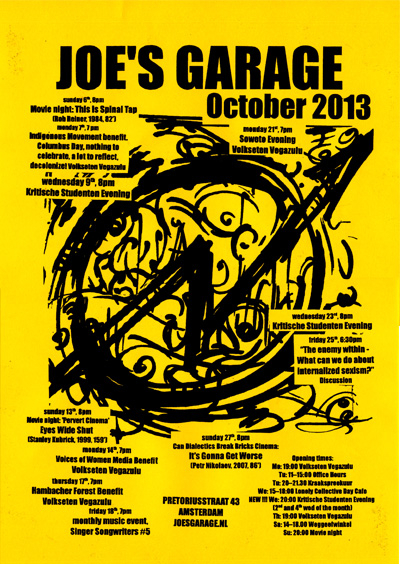 At Joe’s Garage, September has been a busy month. Squatters from UK updated us about the squatting situation over there, the Hambacher Forest activists relaunched their campaign, and Jeremy, ‘Pedalling for Papua‘, made a stop on his tour to tell us about the political situation in West Papua. Skogen and the Balcony Players also made a little surprise performance. A date to write down in your agenda, October 19th, the Valreep will take to the streets of Amsterdam with a ‘Valreep Legalized‘ demonstration. 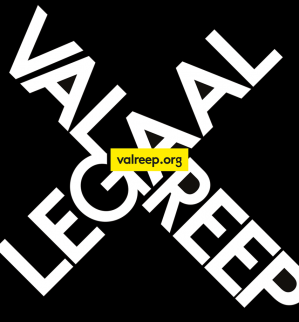 We are all expecting you there to support the Valreep. 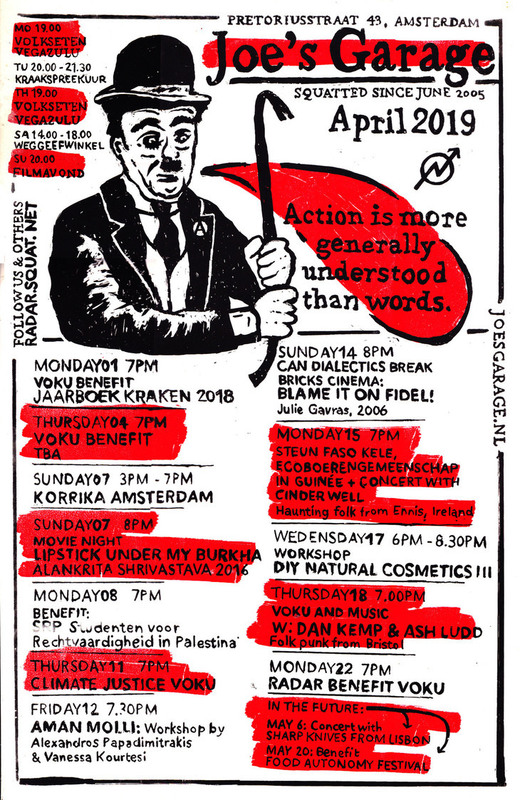 At Joe’s Garage these coming days, you’ll also find various causes to support, the Anti Columbus Day, Voices of Women Media, the Hambacher Forest activists and Soweto. You’ll get another acoustic session. You’ll attend the discussion about ‘The enemy within – What can we do about internalized sexism?’ On the film program, you’ll get to see This Is Spinal Tap, Eyes Wide Shut, It’s Gonna Get Worse. 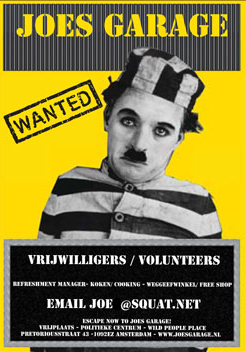 Joe’s is welcoming a new by-monthly event on Wednesday, with the Kritische Studenten Amsterdam. Joe’s Garage is an autonomous squatted political social center, a meeting place in the Transvaal neighbourhood for squatters and non squatters, subsidy free, entirely run by volunteers. New faces, new projects are very welcome, bring your ideas, get involved. Thanks a lot to all our volunteers.